United Launch Alliance (ULA) conducted a commercial Atlas V launch on Wednesday on behalf of Lockheed Martin, orbiting DigitalGlobe’s WorldView-3 imaging satellite. 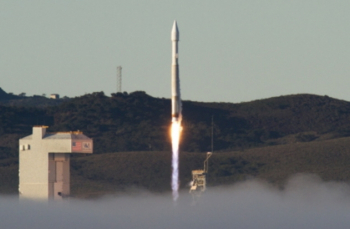 The launch, which marked the first commercial Atlas mission to fly out of Vandenberg, occurred after a trouble-free countdown at 11:30 local time (18:30 UTC). Based on the WorldView-2 satellite, which has been in orbit since October 2009, WorldView-3 is a 2,800-kilogram (6,200 lb) imaging satellite intended for seven and a quarter years of service in low Earth orbit. The spacecraft is based around the BCP-5000 bus and was constructed by Ball Aerospace. It is the third satellite in DigitalGlobe’s WorldView series of high-resolution satellites. Excluding WorldView-3, DigitalGlobe’s current fleet consists of five satellites; WorldView-1, WorldView-2, GeoEye-1, Ikonos 1 and QuickBird-2. Based in Colorado, DigitalGlobe was formed in 1992 as the WorldView Imaging Corporation and was initially headquartered in California. The company was later named EarthWatch Inc. between 1995 and 2001, before taking on its current name. DigitalGlobe’s first two satellites failed before they could enter service. Early Bird, which was orbited by a Russian Start-1 rocket in 1997, suffered a power system failure four days after launch which left it inoperable. QuickBird-1 was launched in 2000 but placed into an unusable orbit after its Kosmos-3M carrier rocket malfunctioned. The October 2001 launch of QuickBird-2, a spacecraft which is still in operation, finally gave DigitalGlobe its first operable satellite. 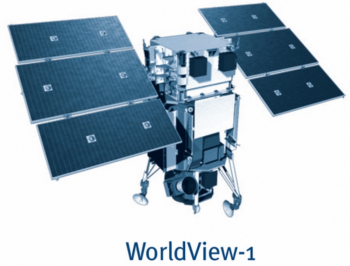 WorldView-1 was launched in September 2007 and was followed by WorldView-2 in October 2009. These satellites are capable of imaging to a resolution of 50 centimetres (20 inches), with WorldView-2 also carrying a multi-spectral camera which provides a resolution of 1.8 metres. WorldView-3 is equipped with the same cameras as WorldView-2, however it will be able to produce higher resolution images by virtue of operating in a somewhat lower orbit. In addition to its own spacecraft, DigitalGlobe also acquired two satellites when it merged with GeoEye in 2013. The GeoEye-1 satellite was launched in September 2008, while Ikonos 1 is an older satellite which GeoEye had itself acquired in a previous merger. Ikonos was launched by an Athena II rocket flying from Space Launch Complex 6 at Vandenberg in September 1999, six months after the previous Ikonos satellite – also known as Ikonos 1 – failed to reach orbit. WorldView-3 is expected to add to DigitalGlobe’s fleet by providing a higher imaging resolution than any other commercial satellite. From an altitude of approximately 617 kilometres (383 miles, 333 nautical miles) its high-resolution camera will be able to take pictures at resolutions of up to 31 centimetres (12 inches). The spacecraft is also equipped with the same multispectral camera as WorldView-2 and a new infrared imager. 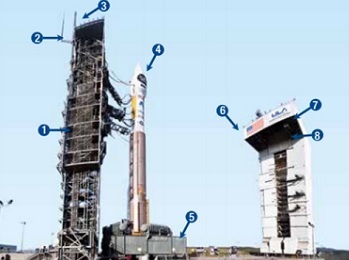 The rocket that WorldView-3 rode into orbit on was the Atlas V 401. The smallest member of the Atlas V family, the 401 configuration features a single-engine Centaur upper stage, no solid rocket motors and a four-metre payload fairing. The Atlas that launched WorldView-3 had the tail number AV-047, and was the forty-eighth Atlas V to fly. The Atlas V made its maiden flight in 2002, lofting the Hot Bird 6 spacecraft for Eutelsat. Since then its forty seven launches have orbited an array of commercial and military communications satellites, GPS navigation spacecraft and DMSP weather satellites for the US Air Force, three X-37B Orbital Test Vehicles, a host of imaging, SIGINT and support satellites for the National Reconnaissance Office and several payloads for NASA. The NASA missions include probes to the Moon, Mars, Jupiter and Pluto, the SDO mission to study the Sun, the Van Allen Probes to study Earth’s magnetosphere, a pair of TDRS communications satellites to relay data to the ground from spacecraft in orbit – including the International Space Station – and the Landsat 8 imaging satellite. In its launches to date, the Atlas V has a near-perfect success record, with just one partial failure which did not result in loss of mission. That anomaly occurred during the June 2007 launch of NROL-30, a pair of ocean reconnaissance SIGINT satellites for the National Reconnaissance Office. 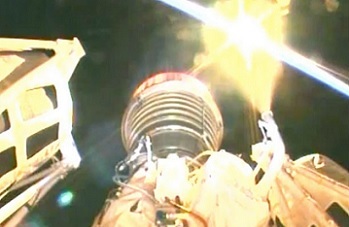 A faulty valve resulted in the Centaur leaking hydrogen, and cutting off early at the end of its second burn. This left the satellites in a lower-than-planned orbit; however they were still able to manoeuvre into their final orbit. Wednesday’s launch was the tenth commercial mission for the Atlas V; following the launches of Hot Bird 6, HellasSat 2, Rainbow-1, AMC-16, Inmarsat-4F1, Astra 1KR, ICO-G1, PAN and Intelsat 14. PAN, a classified mission for an undisclosed government agency, is believed to be a communications satellite. Although a military payload the terms of the contract Lockheed Martin were awarded to procure it are believed to have made Lockheed responsible for delivering the satellite into orbit – hence making it technically a commercial launch despite the nature of the payload. It is unclear whether the CLIO satellite, due to launch later this year, will use the same arrangement. All nine previous commercial missions deployed their satellites into geosynchronous transfer orbit after lifting off from Cape Canaveral. By contrast, AV-047 dropped WorldView-3 off in a near-polar low Earth orbit; the satellite’s final orbit will be a 617-kilometre sun-synchronous trajectory. To achieve this the rocket flew from Space Launch Complex 3E (SLC-3E) at the Vandenberg Air Force Base in California. It was the first time an Atlas rocket has launched a commercial primary payload from Vandenberg. SLC-3E was originally part of the US Navy’s Point Arguello site, used for early reconnaissance satellite launches by Atlas-Agena rockets. The first launch from the pad occurred in July 1961 with the MIDAS 3 missile detection satellite. Space Launch Complex 3, which was previously Point Arguello Launch Complex 1, consisted of two pads – 3 West and 3 East. The West pad is now unused and mostly demolished, having last been used by SpaceX for early testing of the Falcon 1 rocket. It had been intended for use in Falcon 1 launches, however no rockets were launched from the complex under SpaceX’s tenure. By contrast to its neighbour, the East pad is still used by the Atlas. Following the May 1987 launch of the last Atlas H rocket, carrying a cluster of NOSS satellites for the NRO, the complex was deactivated, only to be rebuilt in the 1990s for the Atlas II. The first cryogenically-fuelled rocket to fly from Vandenberg, the first Atlas II to depart SLC-3E carried NASA’s Terra satellite in December 1999. It was followed by two more NOSS launches before the retirement of the Atlas II. Lockheed Martin did not originally intend to launch the Atlas V from Vandenberg, however after Boeing forfeited several launches to Lockheed over an industrial espionage case the old Atlas II pad was converted to accommodate it. The first Atlas V to launch from Vandenberg was AV-006 in 2008, which carried the USA-200 SIGINT satellite for the NRO. The flightplan for Wednesday’s launch wasn’t announced, however the mission began with ignition of the first stage’s RD-180 main engine at T-2.7 seconds. The first stage of the Atlas V is a Common Core Booster (CCB), powered by a single RD-180 – a Russian engine derived from the RD-170 family used by the Zenit rocket. Lifting off at T+1.1 seconds AV-047 manoeuvred onto a southerly trajectory as it begins the climb to orbit. The first stage burned until just past the four minute mark at which point Main Engine Cutoff, or MECO, occurred. Six seconds after MECO, the spent CCB was jettisoned and the Centaur began its prestart sequence. Ignition of its single RL10A-4-2 engine came ten seconds after staging, beginning the first and only burn. The Centaur’s the burn lasted around eleven minutes, followed by just a three minute coast phase, prior to a seven degree per second spin up, followed by spacecraft separation. The launch of WorldView-3 was the sixteenth of the year for the United States, and the tenth for United Launch Alliance. Formed in December 2006 from the merger of Lockheed Martin and Boeing’s rocket production and government launch services divisions, ULA provides and operates all Atlas V, Delta II and Delta IV rockets used by the US Government – including the armed forces and NASA. As a commercial launch, Wednesday’s mission was subcontracted to ULA by Lockheed Martin. It was the first commercial Atlas launch – and hence the first launch contracted by Lockheed Martin – since the deployment of Intelsat 14 in November 2009. 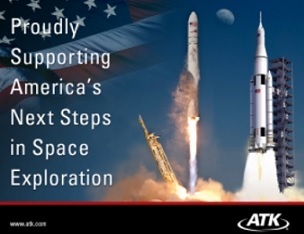 The sixth Atlas launch of 2014, Wednesday’s mission will be followed by the launch of the classified CLIO mission in September for an undisclosed government agency. Believed to be similar to 2009’s PAN mission, this will likely be bound for geosynchronous orbit. Two further launches are planned; carrying a GPS satellite from Cape Canaveral and the NROL-35 payload from Vandenberg. ULA’s only other remaining mission this year will be the December launch of NASA’s Exploration Flight Test 1 – a test flight of the Orion spacecraft – atop a Delta IV Heavy. A planned Delta II launch with the SMAP satellite has now slipped into 2015. 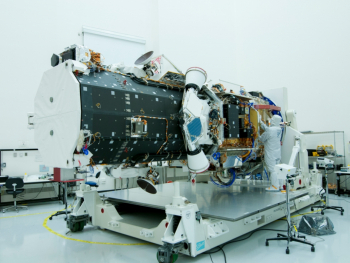 DigitalGlobe’s next satellite, WorldView-4 – formerly GeoEye-2, is currently scheduled for an Atlas launch sometime around 2016. (Images via ULA, Ball Aerospace and NASA).